There is enough food around the world to feed everyone, but it is not always accessible to those that need it most. However there are still people with chronic malnutrition, causing permanent cognitive impairment, when children do not receive proper nutrition in their first 1,000 days, from conception to 2 years old. While one seventh of the world is vulnerable to food insecurity, in the United States, and New york City especially, I see more than enough food wasted in any given day to feed an entire village. What is needed is children like me in wealthy developed countries to bring attention to those children in need and find a way to provide just a small portion of the money that we spend on non-essential foods to be donated to organizations that get the food to those that need it most. It seems that for a fairly small amount of money we can help the most vulnerable young kids in the world by providing them with the required nutrition to properly develop their brains. How can young people like me growing up in a wealthy country, help make the world better for the future? If people in countries and areas that have stable food environments work together we will be able to separate hunger from poverty. If we solve the hunger issue now the poverty issue will solve itself in the future. People that were deprived of proper nutrition growing up are a significant contributor to poverty. If we spend the money now to assure that every child under 2 has access to proper nutrition then in the future we will have less poverty created by the disabilities created by chronic malnutrition. I estimated the cost of providing the nutritional packages to the toddlers of the one seventh of the world that are considered vulnerable to food insecurity. There are approximately 260 Million people in the world under the age of 2 (1). In one year we will help 37 million children grow up to be more productive. Estimates show that properly developed children will make 46% more than those with brain deformities(2). If we assume that each person makes $2/day then their earring potential will increase of $335/yr for every single person that received proper nutrients in the first 2 years of their life, with the help of only $70 from people that already have stable food supplies. Within 2 years of working, the person could make 10 times more money than what was donated to them. Medical science shows that unless young children are fed properly during the first two years of life their brains will be irreparably deformed. This is called chronic malnutrition (3). As Josette Sheeran talks about in her TED talk, providing school lunches in developing countries would change hunger. Parents would send their children to school if they were guaranteed a meal, which was not available or guaranteed at home. Schools providing lunches encourages more parents to send their daughters to school because they are fed there. During the following month, I am going to work on raising the awareness of other young people to help spread the world. I ask is that every person who has spent $3 on a coffee or water bottle today, think about where your money is going. For the price of a small coffee in New York City, a child starving in Sub-Saharan Africa or Southern Asia could be fed for a whole month. A child could change someone’s life by simply donating $3. Hunger creates a cycle of ongoing poverty. Children that are deprived of proper nutrition in the first two years of their lives, could result in irreversible cognitive impairments, and their brain will never grow to the normal adult size. This will limit their intellectual potential, and constrain the jobs available to them, if they can work. According to Kathryn Dewey in Nutrition Reviews, people that were received proper nutrition as a child, made almost double what children with chronic malnourished. 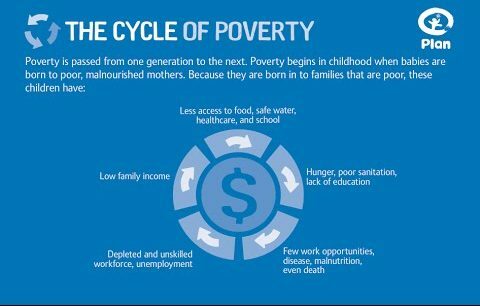 This begins a cycle of poverty and hunger in families and communities, unless we work to stop it. When the generation of children that all had a secure food supply enter the workforce, the economy will be able to flourish. They could become scientists that solved problems that they faced as children, and not let it happen again the the rising generations. Their intelligence and impact can reach full potential. Although one seventh will directly benefit from world-wide food security, the entire world will greatly advance. 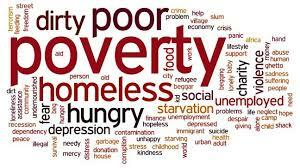 A world goal should be to separate starvation from poverty. Sustainable development goal one is no poverty, and number two is zero hunger. Addressing and ending hunger must come first. In order for adults to attain jobs that keep them stably above poverty, they must have proper nutrition as a child. If a baby’s cognitive development is stunted at two years old, their chances at rising above poverty plummet. We must work on a solution to hunger to eliminate poverty.